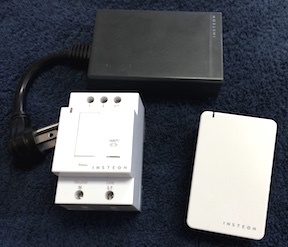 The INSTEON On/Off Module turns lights and appliances on and off. The On/Off Module comes in a number of different packages. These can be wall warts, outdoor switches, outlets, and small packages that fit within electrical boxes. The On/Off Module Device has an input terminal (1) for turning the module on and off, and an output status terminal (1S), which shows the state of the module. If the "1" terminal is on, the module is told to turn on. If the "1" terminal is off, the module is told to turn off. Generally, the "1S" status output will track the state of the "1" terminal. If the module malfunctions or is out of INSTEON range, the "1S" terminal will not track the "1" terminal. The "1S" terminal is useful when one needs to know the actual state of the module. this parameter is only necessary when there is more than one INSTEON network. The port_location is the USB port of the network's INSTEON modem. It is used to differentiate INSTEON networks. In *nix systems, this is in the /dev directory with a name like /dev/ttyUSB0 or /dev/cu.usbserial-00001004. Type "ls -lrt /dev/*" for hints. On Windows systems, the location is COMx where "x" is a number (1,2,3, etc. ).